Applicability: You can use this activity every single practice because it focuses on coordination, movement, and basic dribbling skills. Activity: Each Player has a ball and finds a space inside the grid. When you shout “Green Light,” players begin to dribble around the area. When the coach shouts “Red Light,” players stop the ball, then keep this foot on the ball and put their arms out to the side for balance. Continue. What part of your foot can you use to move the ball fast? Show me! What part of your foot can you use in this game to stop the ball? Show me! How do you stay inside the grid? How do you not run into other players? 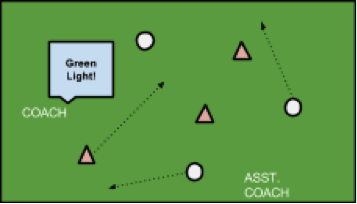 “Blue Light”: players pick the ball up, hold it on their heads and run around making as much noise as possible. Like a police siren! How do you put both knees on the ball? Show me! What is the fastest way to pick up the ball and put it on your head? Show me! How can you escape the monster truck? Show me!